Make your day an unforgettable trip through Washington, DC on one of the most popular tours in town. This 6.5 hour guided bus tour will bring american heroes like Lincoln, Jefferson, MLK and FDR to life at their majestic memorials. You'll explore our nation's most moving memorials from the Vietnam War, Korean War, World War II and the Marine Corps Iwo Jima Memorial among others. The tour takes place on luxurious fully enclosed and climate controlled Motor Coach or an open-top Double-Decker bus when weather permits. All buses are equipped with with bathrooms, WiFi and outlets. Also included in the tour are stops at two of the most popular museums in Washington...The American History and the National Air & Space museums. Your friendly and fun licensed tour guide will step off the bus at each stop and walk with the group to all of the Memorials. 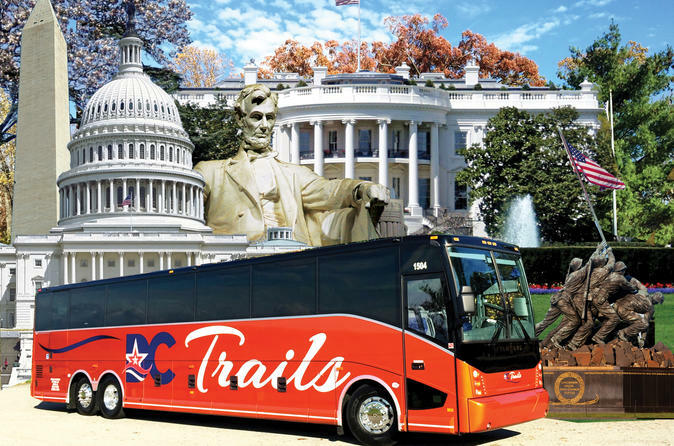 This 6.5 hour tour starting at 478 L'Enfant Plaza SW Washington, DC is a convenient and comprehensive way to explore the best of our Nation's Capital. Also included in the tour are stops at two of the most popular museums in Washington...The American History and the National Air & Space museums. Check the Itinerary for a complete list of tour highlights and stops.